On this Australia Day 2019 long weekend it is vital that we recognise the on-going theft of Aboriginal land, this time at Deebing Creek near Ipswich. Deebing Creek Mission was a ‘Refuge’ to many during the beginning of the Holocaust within these lands. One of first missions in qld. Many suffered at the hands of Invasion and still today many of the Survivor Families retain & can recall the Oral Histories from the ‘Mission Days”. Families were rounded up and even separated before being placed at Deebing Creek Mission. The Mission was established post Battle of One Tree where many Tribal Groups Resisted the Occupation, by British, of the First Peoples Motherlands. Deebing Creek is where some came to survive the reign of terror over their lands. Many married and had children here at Deebing, some built their own homes and cabins with such precision many non-indigenous were envious. Farms & farming practices were at Deebing producing crops and developing revenue for the community. The first Native Cricket Team came from Deebing Creek with fast bowler Eddie Gilbert and others, many well-known sports giants came from here also Robert Anderson was an athlete breaking many records. Ron Richards the famous boxer, Harold Blair the opera singer had strong ties to Deebing Creek Mission too, just to name a few. Deebing Creek in Yuggera Country is survived by many descendants & some families even stayed on at the old mission site accessing the lands to hunt. It is a major part of many people’s heritage & history. THE Aboriginal settlement at Deebing Creek was formally opened on May 2, 1892, by H. Tozer, the colonial secretary. 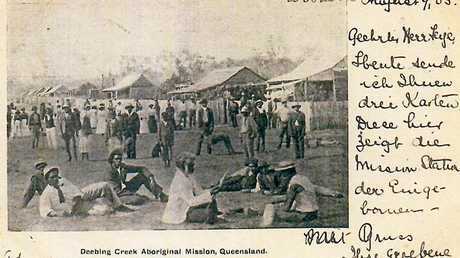 Cricket Match at Deebing Creek Aboriginal Station. Superintendent of the station was the Rev E. Fuller. Mr Tozer named the settlement The Aborigines’ home for the district of West Moreton. An Aboriginal named Johnny Woods married Maggie at the Deebing Creek Aboriginal Settlement on November 23, 1892. The wedding was performed by Mr Fuller and the marriage certificate signed by the Rev Joseph and Mrs Walker as witnesses. Before the establishment of the mission station, Johnny had been a member of the local corp of the Salvation Army. Johnny Morgan, an Aboriginal who died in April 1890, was buried at the Laidley cemetery. A grand benefit concert was held in the Ipswich School of Arts on November 4, 1895, to raise funds for the Deebing Creek Aboriginal Club. On January 28, 1896, the first appearance of the Deebing Creek cricketers in Brisbane was reported. The Aboriginals, under the management of Messrs H. Campbell, James McLean and T.J. Barker visited Brisbane on January 27 to play team representing the National Cricket Union. J. Curtis captained the Deebing residents and A. Henry the Unionists. Others in the Aboriginal team were H. Thompson, A. Coolovool, C.C. Mort, R. Drumley, F. Fogarty, C. George, D. Ross, W. Lake, Edward Thomas and G. Fogarty. There were two mentions of the Deebing Creek Mission Station in October 1901. The first reported the death of a well-known Aboriginal called Peter who was 61 years of age. In his teens, he had fallen from a tree and remained a cripple for the rest of his life. Peter was buried in the cemetery at the Mission Station. The second report was about Aboriginal weddings. Early in March, 1901, Stanley Bell married Minnie Vincent. Then in May, 1901, there was a double wedding; Billy Daylight wed Bridget, and Tiger Stanley married Topsy Burke. On October 21, 1901, Henry a celebrated runner and one of the fastest bowlers in Queensland (probably Australia), married May. Their wedding took place in the vestry of the Presbyterian Church and the Rev P. Robertson conducted the ceremony. The wedding party was made up of several Deebing Creek residents who presented the bridal couple with a wedding cake featuring an imitation cricket ball. Groom Henry was born at Nanango and May came from Beaudesert. Mr A Meston Protector of Aboriginals said the bride’s father had been a prince of the Logan tribe. The mortal remains of the Kanaka Tarragindi Tarraroni were laid to rest in the Ipswich cemetery on January 14, 1913. As a mark of respect to Tarragindi who had been a fateful soldier of the Salvation army for 25 years, the flag at the Salvation Army Barracks Nicholas St flew throughout the day. A special service was held at the Salvation Army hall and this was conducted by Ensign Stowe and Lieutenant Brown. Tarragindi had also been a member of the Star of Ipswich Lodge. Mrs Siemen, her three daughters and Mrs Hoare, of the women’s Christian Temperance Union, visited Deebing Creek Aboriginal Mission in December 1913. They listened to the children at the mission as they sang and recited and they (the children) received cards, buns and lollies after their performance. Mrs Siemen and the others then joined in the various games and watched the children as they swam in the river. The visit concluded with hymn singing and for this Lottie Thompson played the accompaniment on an accordion. Part of the Deebing Creek Mission’s annual report to Mr A. Meston chief Protector of Aboriginals was published in the QT on October 20, 1915. It read – great results were expected from the transfer of the Mission Home to Purga. The new site was convenient to the railway and next to the old Nine Mile cultivation area used by the mission. The residents had been raised another step up the social scale because many neat cottages on stumps had been erected for them. The population at the time numbered 85.